Bob Villa does it again! 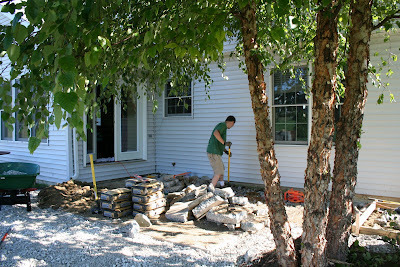 Every 6 months or so, one of us gets the idea to embark upon a home improvement project. Mike is pretty handy so he does most (okay ALL) of the work, but our entire family suffers.These projects always turn into so much hard work! 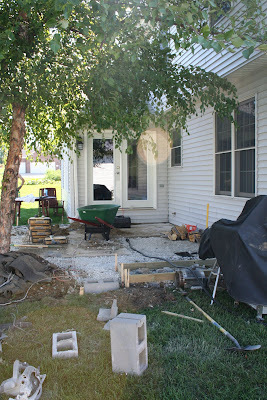 Our old patio was sinking into the house and was a complete eyesore. It was also too tiny to have a table on. 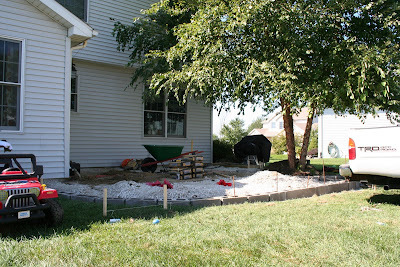 Mike came home one night and said he was bored and would like to start a new patio. 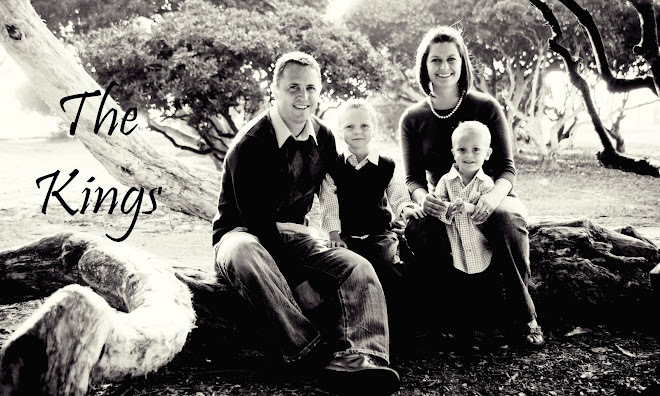 Weeks of backbreaking labor ensued for Mike, while Sheri spent her weekends alone tending the kids. We really do like how the patio turned out. The pictures above are the BBQ, finished patio, and Mike working on the patio. The patio is now pretty big (it actually looks kind of small in the pictures, but it's not), and it is not sinking into the house anymore. We say that this is our last project, but we'll probably be singing a different tune in about 6 months. Just some updates on the kiddos. I'll start with Austie. Austin is no longer a calm, sweet baby. We have a wild little boy on our hands lately. We took him out to lunch today, and I'll just say that we probably won't be doing that for a year or two. He was all over the place. He is crawling, standing up with support, climbing steps, and I think he said "ball" yesterday. He is a great sleeper. He already likes to wrestle with Mike, and he is already a major daddy's boy. He likes to play with Tyler , but Tyler can get a little rough for his tastes. He know he isn't suppoused to go up the stairs so he will start to go up and laugh, then make sure I am watching and go up a few more stairs, turn around and laugh. He likes attention, and just like Tyler is not really great at playing alone. Austin and Tyler are a lot alike. Tyler is our big 4 1/2 year old. He is learning so much lately. He started doing "real" puzzles and loves them. He is learning to write and recognize his numbers and letters. One funny/challenging thing about Tyler is his constant need for socialization. He will go around knocking on ALL the neighbors doors looking for someone to play with. ANYONE will do. He just wants to play with some kids. He is almost always happy and laughing. He isn't so hard to keep up with anymore. He uses a lot of his energy at pre-school and with friends, so at home he is a little more chill. One thing Tyler needs to work on is table manners. If he ever eats at your home, please remind him not to use his shirt as a napkin, and not to use the entire table as his plate. He is the messiest eater I've ever seen! We love both boys so much! Last Saturday we hosted a couples baby shower for some friends. I didn't do an official, final head count, but there were at least 40 people at our house. Luckily, the weather was perfect and guests could be inside or outside. Mike's porch was all done, complete with tiki torches and the tree lit in white lights. It looked great out there. We had been working really hard to get everything ready for this party that I feel completely justified sitting on my patootie all week long. Our only big news is we have now have a new addition to our family- a wii. Mike decided that this would be a great toy to play as a "family". It's been fun so far, but Tyler doesn't really get it yet. He needs constant help. I'm sure by next year he'll be just as proficient as all the other lazy american kindergardners. Tyler can't wait for Grandma and Grandpa to get here. They are arriving on Halloween afternoon. Maybe we'll get Tyler all sugared up and let him have a slumber party with his grandparents that night! Austin has ANOTHER ear infection. I just need to know as SOON as he starts fussing, not napping and not eating it is an ear infection. I called Mike yesterday to complain about Austie clinging and whining all day thinking he was just in a funk. Then, I had the brilliant idea of going to the gym and letting someone else deal with him. Of course the childcare lady came and got me because he had been screaming for half an hour. By then it was too late to see his regular doctor so we paid yet another visit to urgent care. Let me tell you how fun it is to sit in a waiting room with a wild 4 year old and whining baby. It was a blast! I'm calling the ENT today. ENOUGH already. I found these jeans in a box of Tyler's old stuff. I really can't imagine myself buying them. They were too funny not to put on Austin. This is the 2nd time in our marriage THIS has occured! I have lived in 3 towns in my life: Prescott, Provo and now Peoria. P-town used to mean Prescott, so when people say P-town here I think of Prescott. Today we went to downtown Peoria for a walk. Tyler got soaked in the fountain. Austin has been a GROUCHER so he had to be held the whole time. Right now Tyler and Austin are actually playing together. Austin will chase (crawl very fast) Tyler when he says, "You can't get me." It's pretty cute that there is real, live interaction between them now. Mike was home last night, and finally had time to mow the poor, neglected grass. Both boys love playing outside. We'd better get it out of systems because come November we'll be hanging out at home a LOT. I'm NOT looking forward to this Winter! You know how at Halloween time people put a bale of hay on the porch with pumpkins and mums etc.? Well Mike picked up some hay for me, and in a moment of stupidity, I cut the rope bounding the hay together. Now we have a pile of hay on the doorstep. I really can't even tell you why I cut it. Now I need a new bale of hay for all of my cute fall stuff. Don't you hate it when you get NOTHING done all weekend. Bob Villa decided we had to change our back patio (okay we really did have to, it was in BAD shape) so he has been working on that in his spare time. (He was working on the built in BBQ this weekend.) I like to clean over the weekend and Mike can take charge of kids, but no such luck. I really feel unsettled when I have a dirty house. SO, I'm avoiding it by being on the computer. Mike and Tyler had a blast on the father/son campout. Tyler keeps asking when he gets to go back. I think he drank 2 gallons of soda and had a piece of junk food in his mouth the entire time. Mike also let him play with fire. If Tyler burns the house down we all know who to blame.